Kyung-Ji Kate Rhee serves as the Deputy Director of the Center for NuLeadership on Urban Solutions (CNUS), an independent research, training and advocacy think tank that applies Human Justice to achieve public safety, racial equity, community investment, human development and well-being in society. Founded and developed by academic professionals with prior experience within the criminal punishment system, the organization is the first of its kind in the country. She oversees the development of Human Justice the policy/advocacy/training agenda at CNUS. Kyung-Ji is nationally recognized for her expertise in campaign strategy development, youth justice advocacy and dynamic training design for system and community stakeholders on culture change, racial disparity and leadership growth. She serves on the Advisory Board of the Community Justice Network for Youth (CJNY), a project of the W. Haywood Burns Institute, and the Steering Committee of the New York City Task Force on Racial Disparity in the Juvenile Justice System. She has been featured in a range of publications and magazines, including the Utne Reader (Top 30 Visionaries under 30), the Village Voice, The Source, (Top 10 Artists, Albums, & Political Players of the Year), The KoreAm Magazine, the Gotham Gazette, the New York Sun and the Brooklyn Free Press among others. She received her BA from the University of Chicago where she worked with Michelle Obama and Pamela Bozeman to help launch a public service community summer internship program for University of Chicago students. Chino Hardin serves as the Community Organizing Director of the Center for NuLeadership on Urban Solutions (CNUS), an independent research, training and advocacy think tank that applies Human Justice to achieve public safety, racial equity, community investment, human development and well-being in society. Founded and developed by academic professionals with prior experience within the criminal punishment system, the organization is the first of its kind in the country. Chino Hardin was born and raised in East Flatbush and Bed Stuy, Brooklyn. Chino has over 15 years of experience in the field of youth organizing and leadership development, conflict resolution, violence prevention and gang intervention. More than that, Chino is committed to developing and elevating spiritual wellness and creative leadership in youth and communities that are hardest hit by crime, violence and incarceration. Chino’s expertise stems from on-the-ground apprenticeship with seasoned youth development trainers and practitioners from across the country as well as from Chino’s own personal experience in the streets and within the juvenile/criminal punishmentsystem. Thanks to timely, unrelenting and innovative intervention by a series of intervention and leadership programs from Audre Lorde ProjectP to Prison Moratorium Project and Center for Nuleadership, Chino was able to transform the street life of arrests and incarceration into a portal for recognizing and realizing the power that and realize his own potential as a leader in uplifting and transforming the lives of at-risk, gang-affiliated and formerly incarcerated youth. Over the last 15 years, Chino’s charismatic style and studied pedagogical integration have won success and praise in the field of youth leadership development training, specifically applied to youth who have been labeled dangerous and hopeless. Chino has appeared in numerous renowned publications and media outlets, such as Johann Hari Chasing the Scream the Village Voice, City Limits, The Ave Magazine, BET, and the Caribbean Life. Chino’s journey is a truly inspiring one, serving as an apt model for youth aspiring to turn their life around. Chino has a firm belief in becoming the change one aspires to see for the future. He is a firm believer in never measuring one’s success by material possessions, but by how to continuously become a better person. Alex Davis is a Nuleadership Apprentice Organizer at the Center for NuLeadership on Urban Solutions (CNUS), an independent research, training and advocacy think tank that applies Human Justice to achieve public safety, racial equity, community investment, human development and well-being in society. Founded and developed by academic professionals with prior experience within the criminal punishment system, the organization is the first of its kind in the country. Alexander Davis was born and raised in Brooklyn, Crown Heights New York. Alex has gone through many systems, including the foster care of Administration of Children Service, the New York City Department of Probation and Riker’s Island of the NYC Department of Correction. Alex is a graduate of the Institute for Collaborative Education, as well as the ARCHES mentoring program which is how he first came to meet the family at the Center for NuLeadership on Urban Solutions. Arches Alum. Alex is currently a Human Justice NuLeader-in-training. He has dedicated his time to being a part of the Center for NuLeadership because of their investment in his human development, and their belief in his gifts, his potential and his ability to lead. Alex came to the Center because he wanted to allow himself the freedom to pursue his own empowerment in a way that was beneficial to his community. When he made the change, he was struggling with being upset at the system. He came to understand that he could not rely on his anger to make decisions without holding himself accountable for those decisions. Alex is passionate about the possibilities of transformation of human beings. He is passionate about changing the system from one of punishment, to one of healing and solutions. He believes there is a space for people who have been incarcerated and affected by the disinvestments in their neighborhoods, to build together and create communities of accountability that work to keep peace instead of punishment. Alex’s many strengths include an insatiable love of positivity, an attitude that promotes the future and helps others find their potential, and an ability to help connect people with a more powerful vision of world and their own possibilities. Alex brings a wealth of knowledge in youth development and organizing to the center. He is also a remarkable and promising artists, and you can hear his music here: The Oppressor, by Alexander Davis. Cory Greene is Community Research and Training Manager with the Center for NuLeadership on Urban Solutions, an independent research, training and advocacy think tank that applies Human Justice to achieve public safety, racial equity, community investment, human development and well-being in society.. Founded and developed by academic professionals with prior experience within the criminal punishment system, the organization is the first of its kind in the country. Born and raised in East Elmhurst/Corona Queens, New York, Cory Greene is a scholar-activist with a passion for both theory and practice. His experiences as a youth growing up in urban America have contributed to his understanding of the systemic inequalities that exist in under-served communities. As a result, he has committed himself to a wide range of educational projects, advocacy and activism that seek to change existing conditions for youth of color. Cory spent seven years in prison, from age 21-28. During that time, he was part of a collective who shared and examined their collective experiences as youth in inner city communities in an effort to better understand those experiences and to develop a viable theory of social change based upon them. The work of the collective culminated in “How Our Lives Linked Altogether!” (H.O.L.L.A! ), an award winning youth leadership and healing program that secured the prestigious Echoing Green Fellowship in 2016. Cory presently serves as a lead organizer of H.O.L.L.A!. Upon release from prison, Cory enrolled in LaGuardia Community College to study American Sign Language and support the Deaf community. When he graduated from LaGuardia he transferred to New York University, where two years later he received a Bachelor of Science degree from the Applied Psychology Program. After completing his studies at NYU, Cory enrolled in graduate school. He is currently a fourth year doctoral candidate in Critical Social Personality Psychology at the Graduate Center of the City University of New York (CUNY). Cory’s academic research, personal and prison experiences intersect at the consequences of poverty, race and class disparities in the education and criminal punishment systems, born out of the implementation of racist public policy. Cory has served as a research associate on numerous participatory action research (PAR) projects with Michelle Fine at the Graduate Center of the City University of New York (CUNY), designed youth focused curricula, served as an adjunct instructor at LaGuardia Community College, participated as an investigator on research studies at New York University, and taught a course for 8th graders on critical consciousness at the intersection of race and education in America. His education, however, has not halted at the academic level but has also extended itself into the community. As a Healing Justice Organizer with H.O.L.L.A! 's Youth Organizing Collective, Cory is currently invested in developing and supporting the development of an inter-generational youth led city wide Healing Justice Movement. To view a documentary on Cory, visit http://vimeo.com/49038747. K Bain is Senior Community Development Advisor with the Center for NuLeadership on Urban Solutions, an independent research, training and advocacy think tank that applies Human Justice to achieve public safety, racial equity, community investment, human development and well-being in society.. Founded and developed by academic professionals with prior experience within the criminal punishment system, the organization is the first of its kind in the country. No stranger to struggle, K. Bain was born to proud working class parents who immigrated from Trinidad to Brooklyn, New York. Raised mainly in a single parent home with three brothers, K’s mother encouraged her sons to focus on education as a path towards social mobility and self-determination. Although he demonstrated the ability to excel in academics early on, K's attention shifted from school to the streets after he was misplaced in unchallenging classes and told by his high school principal that he would be "dead or in jail" before he was 20 years old. Each of K’s three brothers faced conviction for a range of charges from criminal mischief to grand larceny and attempted murder with a deadly weapon. From these experiences, to losing close friends and family to drugs and violence in the streets, K was ultimately inspired to transition from being part of the problem to becoming part of the solution. K. Bain is currently the founding Program Director for the 696 Build Queensbridge Cure Violence Initiative at the Jacob A. Riis Neighborhood Settlement, Inc. He was previously the New York City Director of legislation and budget affairs for the 45th Council member district in Brooklyn since 2010. His role included duties such as participating in the balancing of New York City’s 70-billion-dollar annual budget, as well as direct oversight of a multi-million-dollar member item budget. K has also been instrumental in the drafting, development and enactment of numerous pieces of legislation, most recently the Community Safety Act. This is a landmark legislation originally consisting of five bills aimed at increasing police accountability, creating better community police relations and safer streets. Both intro 1079 referred to as the oversight bill (creating an inspector general position to monitor the NYPD) and intro 1080 (stop question and frisk bill), which addresses biased based policing were signed into law November 20th 2013. In addition, K. Bain's life as a restaurateur, his passion for the arts, social entrepreneurship and music, all help situate his work around Human Justice and community development which remain at the forefront of his priorities. Whether working with at risk or incarcerated youth or students in universities K. Bain is committed to serving the many who find themselves faced with systemic obstacles that obstruct the growth and development of our most underserved communities. K has maintained a community-minded code that he lives by to this day: “We are and So I am." K has become a true catalyst for change who rhymes in his own prophetic words: "Coal under pressure makes diamonds. It's all about refinement!" We are and so I am. This is about a unity that is inclusive of the community at large. Brittany Smith is a Program Assistant with the Center for NuLeadership on Urban Solutions, an independent research, training and advocacy think tank that applies Human Justice to achieve public safety, racial equity, community investment, human development and well-being in society. Founded and developed by academic professionals with prior experience within the criminal punishment system, the organization is the first of its kind in the country. Brittany Smith was born and raised in Jamaica, Queens, New York with an older brother and an incredible single Mom who instilled in us that honesty is the best policy. She encouraged Brittany and her brother to always be leaders, to follow their dreams and to accomplish their goals. Brittany comes from a family where many have been formerly incarcerated and has witnessed their struggles with reintegrating into the community. Witnessing these struggles made Brittany want to be a part of the solution to issues people who are system involved face. As the proud mother of a 5-year-old son, Brittany has seen how the school system tries to place stigmas on her child, forcing her to consider what may happen to him when he comes of age. At 5 years old, Brittany’s son has already commented on his fear of the police acknowledging that he is afraid of them because they may shoot him. Brittany came to the Center to be a part of something that relieves the stigma and racialized targeting of youth like her son Isreal and other black and brown children. In 2014 Brittany started as a CNUS intern through Berkeley College and was very interested in the Juvenile Justice/Youth part of the program because she wanted to work with incarcerated youth to help influence and empower them in a positive way. Brittany is committed to instilling a level of positivity in the lives of justice involved youth so that they may maintain a hope that life can be fruitful and productive. Brittany now serves as the CNUS Program Assistant. Brittany has a mind that is open to learning and experience new things. She is also at the helm of the Center’s programmatic and logistical planning, assisting all staff in scheduling, program planning, organizational management and project development and completion. Nothing happens at the Center without Brittany’s go ahead. Finally, through Project ReNu, Brittany is the resident Project Renu expert assisting community members with obtaining rap sheets and determining their eligibility for certificates of rehabilitation. Rakim Covington is a Human Justice Youth Fellow with the Center for NuLeadership on Urban Solutions, an independent research, training and advocacy think tank that applies Human Justice to achieve public safety, racial equity, community investment, human development and well-being in society. Founded and developed by academic professionals with prior experience within the criminal punishment system, the organization is the first of its kind in the country. Rakim Covington was born and raised in Brooklyn NY by the NY foster care and group home systems. He is an expert on what youth go through in the system and the effects of system involvement on young black and brown people in New York. Rakim’s system involvement has allowed him to mentor youth as a messenger with experience. Rakim went from the system, to foster care, to a group home, he was then released to his mother’s custody and faced a state bid a few years later. The system creates a void in your life. The love he looked for in his family was filled by what he found in the streets. After Rakim did 5 years in prison, he came to CNUS and spoke with CNUS staff. Rakim continued to come back to CNUS feeling like he had heard it all before but he really got into the work of the Center and devoted himself to contributing to the vision of CNUS. Rakim remains at the Center because he understands the vision and feels like it is an extended family that he will always be part of. He continues to go above and beyond, coming even when he does not have to, to improve the work of the Center and contribute his specific expertise particularly around youth involved work. Rakim is passionate about fatherhood, he is the father of a 6 year old girl. He is passionate about meeting young kids he used to run the same streets as, and offering his experience and exposing them to where they will end up if they don’t pursue their own positive potential. Rakim can do it all. He takes pride in being able to maneuver any kind of situation or assignment with an emphasis on timeliness and getting the job done right. He consults around programmatic issues involving violence prevention and youth empowerment work. Rakim also offers assistance with youth involved in Next Steps Programming. Ryann Holmes is Community Arts and Economic Development consultant with the Center for NuLeadership on Urban Solutions. Ryann has worked and lived in Brooklyn since 2005, fighting for love, and the freedom of our people. By cultivating creative spaces and supporting the economic development of the community, Ryann continues to dream and to create pathways of creativity, expression, beloved community, and love as wealth. 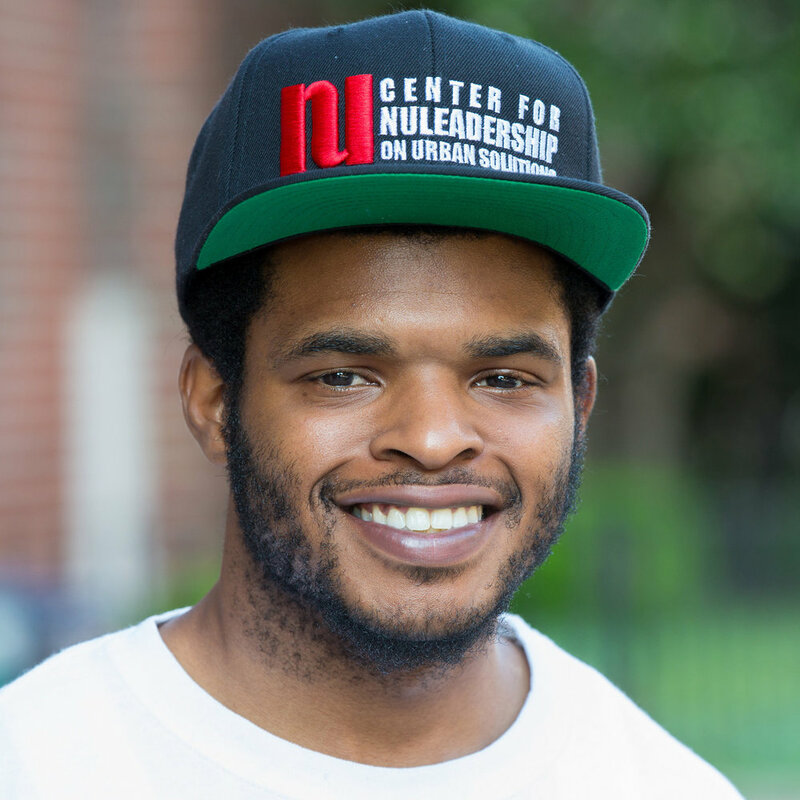 As a person whose immediate family members have been traumatized by the criminal injustice system, Ryann has been committed to the Center for Nuleadership since 2012 as a youth mentor. Since 2016, Ryann has taken a larger role as a Community Economic and Arts consultant for Nulederships programs and initiatives. Ryann’s expertise is in building communities organically, curating creative spaces, and connecting folks in strategic ways. Ryann has worked in every industry from retail to philanthropy, but found most happiness when creating cool things with talented friends. Ryann also found joy and magic in being a part of queer, black culture in Brooklyn. So, in 2009, Ryann founded the bklyn boihood collective. As of today the collective has grown to four core members, based in Detroit, Miami, and Brooklyn, over 50,000 online followers, 6 calendars, annual parties, monthly gatherings, and a published anthology called Outside the XY. Ryann was the Director of Community Programs at the Museum of Contemporary African Diaspora Arts (MoCADA), from 2012-2015, and rebranded/created the annual Soul of BK Festival, co-created over 100 arts programs with the Fort Greene’s housing projects community, and co-managed the logistics of Bed Stuy’s only film festival for children of color. In 2016, Ryann was voted one of Brooklyn Magazine’s top 100 cultural innovators. Ryann is also the co-founder of Lucid Haus records, an indie music label based in Brooklyn, featuring artists like Nappy Nina, Theo Mode, & Ria Boss. Ryann is also a music supervisor for “195 Lewis”, a boundary breaking web series that explores the lives of queer women of color in Brooklyn, New York. Ryann has an MBA from Baruch College in Social Entrepreneurship.